Finn Felting Fanatic – Craft-a-licious . . Here we are in the Margaret River region, where I don’t have enough holes in my belt to indulge in the enormous amount of cafes, restaurants and wineries, not to mention the chocolate and nougat factories! Damn, I’ll have to start my diet next week now .. maybe ..
Finn – though it’s only just beginning ..
Look at my fabulous felted finn! I love et – LOVE ET! After felting my sampler I thought I’d try a knitting and felting a mug before working on a whole teapot creation with spout shaping bit. And behold, a before and after shot of aforesaid mug which is felted to the max!! I was seriously considering making a hairy cup of coffee in it, then thought that I should really test its liquid-tightness properties before filling it with scalding water and sitting down on a chair with it in my lap. Sadly (thou fortunately for my lap) it held the water for about 30 seconds before it started leaking. I was devastated! – it failed the basic test. After pondering if it should be knitted with double yarn before felting it next time, I then thought perhaps it’s time to stop this madness of trying to create a felted liquid-retaining vessel and just move on, knowing I’ve been beaten. Nonetheless, perhaps a teapot knitted in an argyle pattern, or even one sporting warts – would make interesting kitchen accessories. This then means that my friends when they do come to visit, may have to suffer a refreshing alcoholic beverage poured from a normal teapot instead of a felted one. However, the felting qualities of finn yarn really are fantastic. Thank you Maureen at Fairfield Finns, your 8ply is beautifully soft, quick to knit up and, most importantly, a fabulous felter! Recently I came across an interesting way knitted patterns can now be read and created. Stitch Maps means we’re no longer restricted to the rigidity of a fixed chart or graph, seem to be really easy to use and some can be created for free. Increases and decreases visually flow, rather than step, through a pattern. So if any tinking or jogging is required, the map easily shows how the stitches impact each other – so re-doing is less of a problem (at least that’s my interpretation on seeing the stitch map site). I think using these maps may make it easier to create my teapot patterns. I may buy it, and will let you know how I go if I do make the purchase. There’s also a Stitch Maps Ravelry group if you want to check them out. And here is a little teaser of Asa Tricosa’s Mio gloves I’ve decided to foolishly knit in 43 degree heat, possibly because they just look so cool! 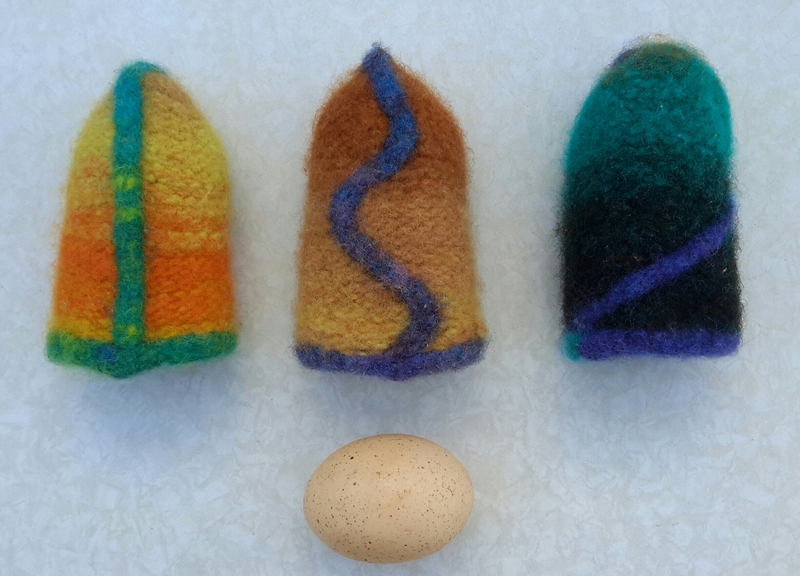 .. and just had to apply different versions to some egg cosys as they are such fun! 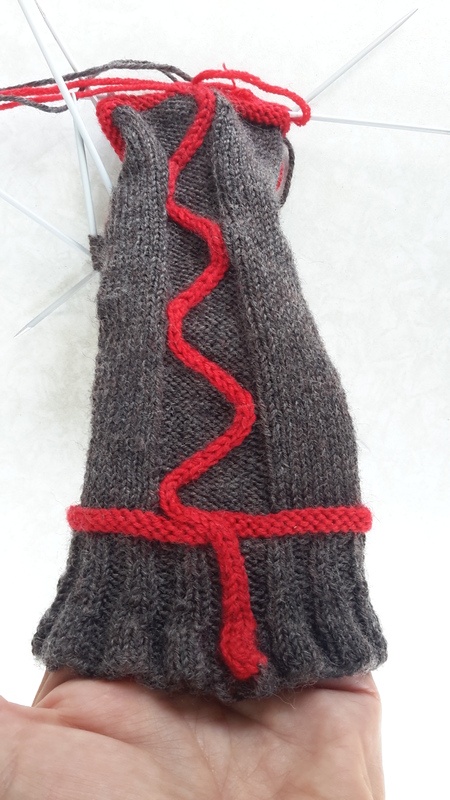 The meandering cable down the back of the hand and thumb make them both fun and interesting to knit and look at. My challenge is if I can actually finish TWO gloves, and not start on a little ‘inbetween’ project – or 2 or 3 .. and never end up finishing the 2nd glove. Hoping your projects are working out (and finishing!) as you want them to. Who can diet when there is chocolate around. Well said – exactly my thoughts Sandy! Thanks Wolfberry! No, I’ve not seen a felted mug before either, but I do quite like how it turned out. Yes, it will be a trial knitting the second glove, then again, I should really finish the first one … that will be my first challenge! Hi Cathy, Sounds like you are having way too much too fun traveling and crafting, and of course sampling all the delights along the way…..good stuff!!!!! Keep on enjoying and I look forward to your next destination. Jen!! Yes, the fatness of retirement is fitting me far too well – damnit!! I do hope all’s well in your world and you’ve braved that Melbourne heatwave with your usual calm aplumb! I just love the unusual / challenging tasks you set yourself Cathy! What about something easy / enjoyable like wine sampling. I hear M. river is the perfect place for this …… yum chocolate and wine together, a match made in heaven. That mug is M.A.D ness. Not only did you knit a handle & base( what tha..?) but you accurately estimated the felting proportions of that fin wool both lengthways and crossways. So technical Cath!! Inside your brain must be so ordered and free of all lint & dust. …You’ve prob got an special auxiliary Knitting Brain tucked inside your armpit or behind your knee. I love how you appear to ” freestyle” up a mad object, but it’s actually the combination of years of experiments and experience. WHAT THE F WILL YOU COME UP WITH NEXT?! Argyle teapot sounds tres intriguing. If I visited the choc n nougat factories with you, I reckon we could get the whole WA economy kickstarted pronto. Trenchcoats on BatGirl! FG – yes!! You got it!! It did take lots of experiments to get that mug right, and the end result to be felted in the correct proportion was a bit tricky – thank you so very, very much for noticing!!! Yes, an argyle teapot may well be worthwhile creating … I should really get onto that pattern … sumtime. . Right again!! I reckon we could near single handedly bring the WA economy back to black if we visited those choc and nougat places together … not to mention the cheese, ice cream, and bakery places in between the coffee places, of course! Thanks so very kindly for commenting – and your congrats, I really appreciate it! Happy and safe travels to you guys! Wow…really? Did the previous post just give you a compliment whilst simultaneously smacking you in the face?…seems he has absolutely no plans to use his manners either..
Well done on your Caravan & Motorhome debut Cath! I’m gonna subscribe to that mag now. Great work! Thanks FG – you’re always so very kind to me!! Leather-like used tea bags + a great ice-cream-related invention! What?!! End of year – AGAIN!! Squishy Circuits Making circuits using dough and other stuff! Junker Jane Dollies that are in need of lots of loving!